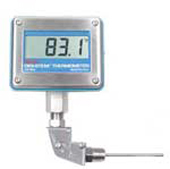 Palmer’s Process Thermometers are used in many different applications, including power plants and piping, chemical processing plants, breweries, canneries, heating and cooling equipment. Our New DST600 RTD Temperature Indicating Device offers new technology designed specifically for Low-Acid Canned Food Retorts, USDA, Dairy and Pharmaceutical Processors and Temperature Critical Applications. Palmer's Dial Thermometers feature a unique direct-drive dual-wound bourdon coil, connected directly to the point shaft, providing uncompromising accuracy in a dial thermometer. Our Bimetal Thermometers offer industry-leading performance and accuracy, and our Slip-Fit and Replaceable Element Bimetal Thermometers offer cost saving options for thermometer replacement. Wahl’s Digi-Stem® Thermometer and Transmitter Systems provide digital accuracy and reliability for temperature measurements in rugged industrial environments. Our variety of rigid stems and remote interface connections accommodate most installations.